1, 2, 36, 6728, 12988816, 258584046368, 53060477521960000, ... オンライン整数列大辞典の数列 A004003. Bodini, Olivier; Latapy, Matthieu (2003), “Generalized Tilings with Height Functions”, Morfismos 7 (1): 47–68, ISSN 1870-6525, http://www-rp.lip6.fr/%7Elatapy/Publis/morfismos03.pdf . Faase, F. (1998). “On the number of specific spanning subgraphs of the graphs G X P_n”. Ars Combin. 49: 129–154. MR1633083. Hock, J. L.; McQuistan, R. B. (1984). “A note on the occupational degeneracy for dimers on a saturated two-dimenisonal lattice space”. Discrete Appl. Math. 8: 101–104. doi:10.1016/0166-218X(84)90083-0. MR0739603. Kasteleyn, P. W. (1961), “The statistics of dimers on a lattice. I. The number of dimer arrangements on a quadratic lattice”, Physica 27 (12): 1209–1225, Bibcode: 1961Phy....27.1209K, doi:10.1016/0031-8914(61)90063-5 . Kenyon, Richard; Okounkov, Andrei (2005), “What is … a dimer?”, Notices of the American Mathematical Society 52 (3): 342–343, ISSN 0002-9920, http://www.ams.org/notices/200503/what-is.pdf . Klarner, David; Pollack, Jordan (1980), “Domino tilings of rectangles with fixed width”, Discrete Mathematics 32 (1): 45–52, doi:10.1016/0012-365X(80)90098-9, MR588907, Zbl 0444.05009 . Mathar, Richard J. (2013年). “Paving rectangular regions with rectangular tiles: tatami and non-tatami tilings”. arXiv:1311.6135. Propp, James (2005), “Lambda-determinants and domino-tilings”, Advances in Applied Mathematics 34 (4): 871–879, arXiv:math.CO/0406301, doi:10.1016/j.aam.2004.06.005 . Ruskey, Frank; Woodcock, Jennifer (2009). 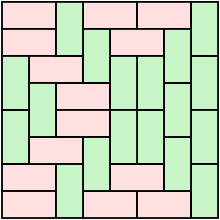 “Counting fixed-height Tatami tilings”. Electron. J. Combin 16 (1): R126. MR2558263. Sellers, James A. (2002), “Domino tilings and products of Fibonacci and Pell numbers”, Journal of Integer Sequences 5 (Article 02.1.2), http://www.emis.de/journals/JIS/VOL5/Sellers/sellers4.html . Stanley, Richard P. (1985). “On dimer coverings of rectangles of fixed width”. Discrete Appl. Math 12: 81–87. doi:10.1016/0166-218x(85)90042-3. MR0798013. Thurston, W. P. (1990), “Conway's tiling groups”, American Mathematical Monthly (Mathematical Association of America) 97 (8): 757–773, doi:10.2307/2324578, JSTOR 2324578, http://jstor.org/stable/2324578 . Wells, David (1997), The Penguin Dictionary of Curious and Interesting Numbers (revised ed. ), London: Penguin, p. 182, ISBN 0-14-026149-4 .